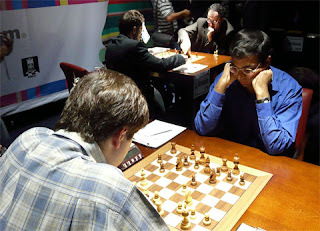 In round 12, Anand was in the position of being able to guarantee at least a tie for first with three straight draws. Only Gelfand could catch him and that would require three consecutive wins or an Anand loss. But Gelfand came up with a sparkling win with the Black pieces, meaning there was still all to play for.